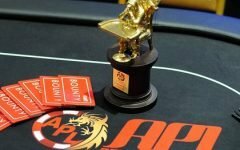 It was a grinding battle for the title at the Poker King Cup National’s first side event, the NLHE, with 46 entries, each one contributing PHP6,000 ($130) into a prize pool that amounted to PHP245,400 ($5341). The champion was finally decided when Alan Honyin eliminated Kimura Lee at the heads up round to claim the first place cash prize of PHP88,300 ($1925) and the event trophy. Entering the final table, Honyin was clearly the man to beat. He held a massive chip lead all day and was highly active at the table. 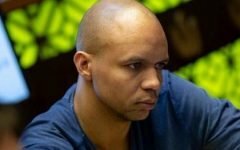 During the bubble stage, Honyin accumulated more chips by eliminating Brian McAllister with his ace-seven finding an ace on the river against McAllister’s pocket nines. 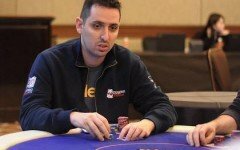 With everyone guaranteed a payout, Ben Abrahams sent the lone lady in the mix, Vilma Goldman, to the rail in fifth place. At four-handed, action slowed down significantly until Kimura Lee landed two pair against Tek Choong Ng’s top pair to bring the table down to three. At this stage, Honyin was the first to ship in a healthy pot when his pocket sevens improved to quads against Lee. 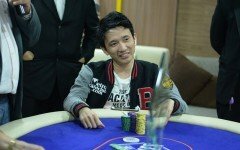 Action ensued with Abrahams picking up several pots only to lose a big chunk when he doubled up Honyin with his king-ten losing to ace-queen. Abrahams couldn’t keep up and eventually bowed out in third place at the hands of Lee. The event came to a close with Honyin eliminating Lee to pick up the first side event trophy of the PKC National.